A study of the hooves of New Zealand’s Kaimanawa wild horses has found wide variation between horses, with foot abnormalities being surprisingly common. A study of the feet of 20 Kaimanawa wild horses found there was no consistent foot type. The researchers found 35 per cent had long toe conformation, 15 per cent had medio-lateral imbalance, and 85 per cent of horses had lateral wall flares. Other common abnormalities included large hoof wall defects, frog abnormalities and contracted and under-run heels. The findings were contained in a report published in the Australian Veterinary Journal. 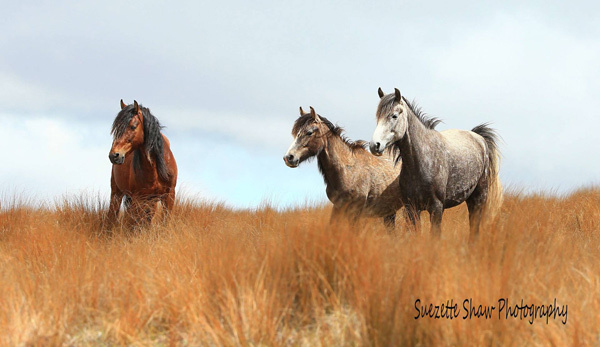 A family group of wild horses at home in the Kaimanawa Ranges. © Bethany Judson. The feet of feral horses, such as the North American mustang and the Australian brumby, have been held up as examples of ideal conformation. However, the findings of the New Zealand study indicate that the natural lifestyle – freedom to roam, and the ability to choose what to eat – does not necessarily result in ideal foot conformation. Kaimanawa horses are small (133 to 151cm at the withers), being descended from Welsh and Exmoor-type ponies that have been feral since the 1880s. Other bloodlines were added as the result of escapes from farms and cavalry units so that present-day horses are more closely related to the thoroughbred. About 1500 animals live in a land of upland plateaux, with steep hills, river basins and valleys, covering an area of about 700 square kilometres. The research team took standardised photographs of all four feet and lateromedial radiographs of the left fore foot of 20 adult horses from the Kaimanawa horse population. The most surprising finding in the study was the radiographic and visual evidence of chronic laminitis. Laminar rings were present on 80 per cent of horses. In contrast to the more standardised conformation of the feral horses of North Australia, the Kaimanawa horses had a wide range of foot shapes. According to Hampson, this is most likely explained by differences in substrate hardness and distances travelled, and the effect of these two variables on hoof wear. “The large range in the morphometric variables and the high incidence of abnormalities in the feet of Kaimanawa feral horses may be related to dietary or environmental influences, or a combination of both,” he writes. “There may be insufficient environmental pressure driving natural selection of foot type. In a further study, Hampson looked for microscopic evidence of chronic laminitis in hoof samples. Histopathologic examination revealed a high incidence of changes in the laminae. Many samples had changes in the laminae. The features were similar to those found in domestic horses with chronic laminitis. This seems to be the first study to confirm microscopically that chronic laminitis occurs in feral horses, Hampson points out. It supports the hypothesis that the horse is vulnerable to laminitis irrespective of its state of domestication. Maybe the physiological and bioengineering adaptations of the foot, that give horses such speed and agility, have been achieved at the cost of vulnerability. Morphometry and abnormalities of the feet of Kaimanawa feral horse in New Zealand. BA Hampson, G Ramsey, AM Macintosh, PC Mills, MA de Laat, CC Pollitt. ← Totilas wins again, and we did too!